Well today I decided to make a Halloween version of it! I just simply added some candy corn & added a tag & it was DUNZO! ;) This is a PERFECT & EASY treat for just about ANY occasion! The lightbulb jars are from Hobby Lobby. Keep in mind, I would not recommend them for children since they are glass! P.S. Don't forget to play along w/our "Black & White" challenge we have going on right now HERE! 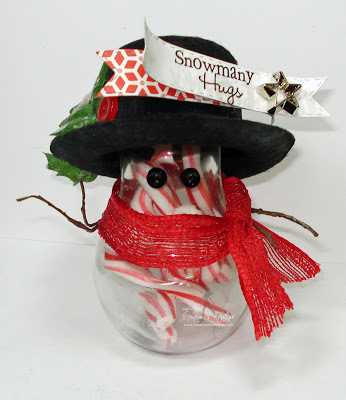 What fun projects and video I loved your little snowman from last year and your spooky Halloween treat is so cute. Thanks such awesome ideas for using all your goodies. Loved your little story about your mama and Hobby Hobby so cute!! Good luck at your doctor app't. today and hope you're able to find out what's going on. I LOVE LOVE LOVE your light bulb treat idea Emma!!! Such an adorable way to give some yummy Halloween candy!!! And that tag you added....adorable!!!! Awesome job as always by the DT!!! They always inspire!!! Your light bulb projects are both so cute!! Love the candy corn inside the Halloween one...OMG adorable! DT...you rocked once again!! LOVE what you all came up with. Emma, that lightbulb is adorbs. I remember when you made the Christmas one, I went right to the Hobby Lobby site and ordered some. I gave a few away as gifts with red and green M&M's in them. I thought they were the most cutest things ever. I haven't seen them in my area so I was so glad to have been able to get them. Love all the Designer's projects, awesome, as usual. love love love those lightbulbs! Oh wow Emma this is just to cute!! I have to find some of these would be great for my girls stocking this year. Thanks for sharing your ADORABLE project! I love that cute little light bulb...I need to go and find them. We don't have a Hobby Lobby here in Hawaii but I hope I can find them somewhere. Best of luck at the sleep doctor....sorry to hear you haven't been getting enough rest. My husband has that CPAP machine too...it really helps him to sleep better. Hope you feel better soon...Take Care! Love your treat ideas! Halloween is my favorite too, cant wait for all the holiday fun:) Best of luck on your appointment today Mrs. Emma. I hope you start to feel better soon and start getting more sleep in your nights rest:)Take care! So many fabulous treats...love them all but that light bulb filled with candy corn is just the cutest thing ever! I love the candy corn treat bulb and idea to make the tag. Still think the Christmas one is way cute too. Everyone had such wonderful projects. Good luck with the sleep doctor...I hope you find some relief. Sweet Dreams! Fabulous DT Projects for sure! Everyone's projects turned out awesome! Emma...your lightbulb treat holder is AWESOME! I have never seen anything like it but now that you have shown us how to do this up, I will be trying this! And OMG I almost about spit out the water in my mouth when you were imitating your mom saying "hobby hobby" HAHAHA Soooo funny!!!!!!! Gotta love our mamas! But she's right about the fact that they have good sales! I love that store! Have a great Sunday!! !